I discovered this author a few years ago, in the middle of his Alex McKnight series. This gave me the opportunity to go back and read them in order. They’ve always been well-written, meticulously plotted, and feature interesting and believable characters. 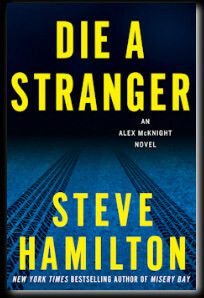 Die a Stranger is no exception; in fact, it’s a particularly compelling book. One of my favorites in the series. The last chapter is killer. 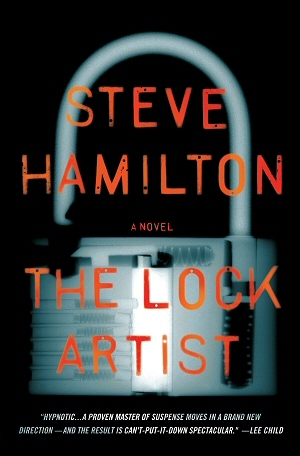 Hamilton has also written a number of other books – his standalone The Lock Artist received an MWA Edgar award for Best Novel in 2011; I thought it was creative and fun, but not my favorite. I’m a little late to the Die a Stranger party… it came out in 2012. The good news is that my delay means I don’t have long to wait until the next Alex McKnight book: Let it Burn is scheduled for publication in July. Steve Hamilton’s no newcomer. He’s the author of the Alex McKnight series of mysteries sent in Michigan’s upper peninsula, and his debut novel, A Cold Day in Paradise, won the Edgar for the Best First Novel by an American Author. I discovered it in a used book store and eagerly snapped up subsequent books. And it’s great to see his new book – possibly a standalone, but perhaps the first in a new series? – nominated for Best Novel. So hang on, because this is my story if you’re ready for it. I was the Miracle Boy, once upon a time. Later on, the Milford Mute. The Golden Boy. The Young Ghost. The Kid. The Boxman. The Lock Artist. That was all me. But you can call me Mike. The book’s in first person, and an engaging person it is. Michael Smith was shaped by tragedy – at the age of 8, he was the only survivor of a brutal crime. And he hasn’t spoken since. Raised by his Uncle Lito (of Lito’s Liquors), Mike shows an uncanny early aptitude for opening locked doors. Through an improbable series of events, Mike ends up taking the rap for teenage vandalism all on his own, forced to “make restitution” to the victim, a guy who tries to pay off his debt to the mob by introducing them to Mike, leading to Mike’s apprenticeship to The Ghost (a long-time “boxman,” safecracker, due for retirement), a box full of pagers that go off when his skills are needed, and involvement with a group of grifters. All by the age of 18. And, oh yeah, he’s in love. Excellent things about this novel: The first-person voice is engaging, truly. Mike Smith is totally believable, and you care about him. The plot is fast-moving. The Ghost is interesting. Plus, I am convinced that Steve Hamilton can personally open any lock you put in front of him. That’s how much he knows about locks. He makes me feel guilty about how much I fudge my research. Weaknesses: The plot is, as noted above, improbable. Hamilton keeps you buying it as you go along, but it doesn’t hold up as well on reflection. And the whole cadre of con artists were not well-developed, believable characters. Overall: This’ll be a great movie. Ranking: No contest. The Lock Artist is a fun read, but it ranks below I’d Know You Anywhere on the Lunchbox Edgar Rating Meter.